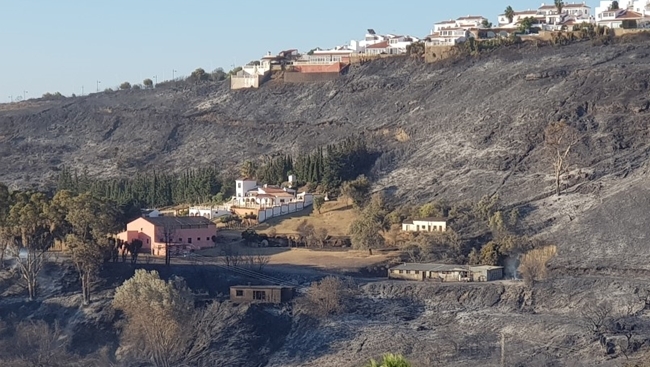 The fire, which started at around 1.40 am, in the Goleto area soon spread thanks to very high winds and threatened the urbanisations at Los Hidalgos and Princesa Kristina leading to the evacuation of some 400 residents and tourists. 50 firefighters from stations in Manilva, Estepona, Algatocin, and Coin battled with the flames throughout the night, hampered by the lack of air support which cannot operate in the dark. The local council opened up the sports centre in Sabinillas to provide shelter for evacuees, and a number of local individuals and bars offered shelter and refreshments. At one point the main A7 was closed to traffic leading to problems for those making the commute to work. Firefighters had the fire under control by around 7 am and with daylight two helicopters turned up to give the fire the final death blow. Fire crews remained on duty most of the day dealing with flare ups and generally damping down. Fire investigators are working to ascertain the cause of the fire. Once again praise must go to all the emergency services including the Infoca firefighters, the fire services, the local police, Guardia Civil and the volunteers from the Civil Protection force, whose hard work ensure there were no injuries despite the serious nature of the blaze.